At Integrity Automotive Maintenance & Repair, we are going to do the right thing for you by evaluating, testing, and repairing your vehicles correctly in a timely manner. We understand that our customers are busy and that you have families, jobs, and lives. We do our best to listen to our customers’ concerns, not only about their cars but their needs. We understand being on a budget, so we give personal attention to every customer so that we understand your questions and needs and do our best to help you with whatever it is you need to make vehicle repair smooth. We will give rides home, to work, and provide loaner cars. We are willing to go the extra mile when people let us know what they need we are always willing to help. Our customers enter as guests and leave as our friends. Integrity Automotive is your full-service auto repair shop that cares about quality, safety, and value. We are friendly and helpful, personal and reliable! Bring your automobile, truck, hybrid car, SUV, motorhome, or RV to our shop to receive our top quality service and repairs. Our customers can relax whenever they leave their service needs in our capable hands. It’s not just talk—we put our money where our mouth is. We stand confidently behind every service we provide. Our highly trained ASE certified technicians are fully equipped to perform any and all needed repairs on your vehicle in the unfortunate event of a component failure. 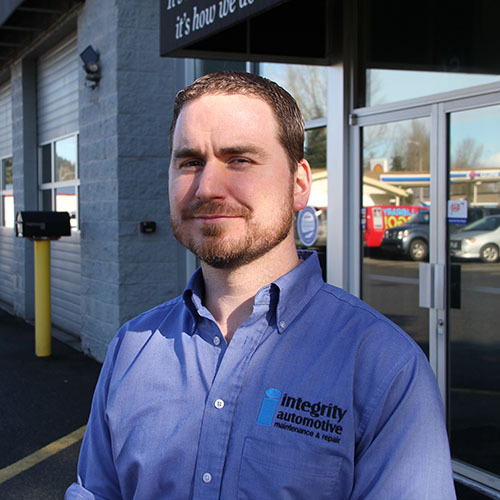 Nate Bean, President and Founder of Integrity Automotive, was born in Portland, OR and moved to Seattle at the age of 4. He has lived in the greater Seattle area since 1970. He has been married for 19 years to his beautiful wife, Susan. They have two daughters: Marissa, 26 and Shalyn, 24. Their son, Tom, is 36 years old, and they have 3 grandsons and 1 granddaughter. Ty is 16 years old, Jackson is 6 years, Trenton is 5 years old, and Makenna is 3 years old. Nate’s passion for cars began in high school when he purchased his first (drivable) vehicle, a 1969 Mercury Cougar. After graduating from Ingraham High School in Seattle, he attended Lake Washington Voc-Tech for 2 years in the Automotive Mechanics training program. Nate worked in several independent shops and new car dealerships before founding Integrity Auto Repair in 1998. He has more than 30 years of experience in the automotive industry. He is an ASE Certified Master Automotive Technician, ASE Certified Advanced Engine Performance Specialist, Chrysler Certified Automotive Technician, and Washington State Certified Emission Specialist. He earned his Accredited Automotive Manager certification from the Automotive Management Institute in 2006. Nate is a member of Living Hope Bible Church in Issaquah. He enjoys fly fishing, RV travel with his family, bicycling, traveling, playing clarinet, and street evangelism. He is a graduate of the Living Waters Ambassadors Academy and enjoys serving those in need. Nate is involved with several local and international ministries including Prisoners for Christ, Global Training Network, the Christian Research Institute, and Living Waters Ministries. His passion for serving Jesus Christ is manifested in reaching out to incarcerated criminals and through street evangelism and open-air preaching. Nate has served in and led prison missions teams to northern, southern and eastern India; Honduras; Rwanda; Burundi; Congo; Burkina Faso; Togo; Ethiopia; and Malawi, Africa to share the good news of the gospel in prisons and unreached areas of these countries. Nate’s passion for prison ministry stems from the relationships he’s established with other volunteers around the world and from learning of the conditions and hopelessness experienced by inmates in prisons around the world. Nate is quoted as saying “I can’t not go back” after returning from the foreign mission field and serving in overseas prisons. If you want to know more about who God is and what he requires of us, click on this link. Tom Johnson joined the Integrity Automotive team in December 2005. Tom was born in Butte, Montana and moved to the Seattle area in 1998. He moved back to Montana, but decided Washington had more opportunity. Tom lives in Sammamish with his 15-year-old son, Ty. Together, they enjoy fishing, going to parks in the area, and simply playing around. Tom has a large family that includes four sisters and one brother. He is very family-oriented and spends his free time with his son or his other family members. Tom is a very valuable asset to the company. He likes customer service involvement and helping to solve problems that can arise from having to have your car in the shop. He continues to build his business skills to ensure he delivers the best experience when assisting our customers at Integrity. He take great pride in helping his customers make the best decision for their vehicles and their families. He is always very willing to answer all of our customers’ questions and providing our clients with an education about their vehicles. Tom attended Bellevue Community College at night and weekends and received his AA in business while working a full-time job and raising his son. His commitment to his job and furthering his knowledge is apparent in his attitude and helpfulness. He intends to continue his education in business. Tyler joined our team in 2013 after spending 10 years as a service consultant at Bellevue Honda. Tyler was born in Eugene, OR but moved to Renton when he was four. He has lived in Renton ever since and attended Hazen High School. Immediately after graduating from high school, he started working at the Honda dealership. Tyler enjoys working with our customers and being able to connect with them on a personal level. He loves working in the automotive industry and would like to one day be in a management position. Because of his experience at Honda, he is very helpful to our customers who drive Honda or Acura vehicles. Tyler spends his spare time watching movies and playing video games. He is also a casual Seattle Sounders FC fan. Marvin Gohl is our Shop Foreman and Lead Technician. With 30 years of experience, he was our first technician and has been a part of the Integrity Automotive team for nearly 20 years. Marvin is an ASE Certified Master Automobile Technician, ASE Certified Advanced Engine Performance Specialist, Washington State Certified Emission Specialist, and GM Certified Automotive Technician. Marvin has proved himself to be one of the most qualified and skilled technicians in the Seattle area. Marvin enjoys throwing darts, playing poker, and spending weekends with his 26-year-old son, Aaron. He has a Plymouth Prowler that he has been upgrading and tricking out for the past several years and recently developed a new passion for riding his Honda Fury motorcycle. Marvin lives in Issaquah and spends weekends at the coast or in Eastern Washington. Marvin was born in Newbury, England in 1971 and moved to numerous areas of the United States during his father’s 20 year Air Force career. He has been in the greater Seattle area since 1982. Marvin graduated from Universal Technical Institute in 1991 and has been working in the automotive industry ever since. Glenn Sorenson is an ASE Certified Automotive Technician and Engine Repair Specialist with 35 years’ experience in the automotive industry including 20 years with General Motors. Glenn joined our service team in March of 2003 and has proven to be one of the most accomplished heavy repair technicians in the industry. Glenn lives in Renton with his wife of 17 years, Allison, and his two sons, Conner, 16 and Spencer, 11. Glenn was born in Seattle and grew up in Bellevue with 3 brothers. Glenn has achieved many skill certifications from General Motors and was a Chevrolet and Cadillac technician for many years before coming to Integrity Automotive. Glenn’s engine repair abilities and skills are truly unprecedented and his quality of work clearly sets him apart as a leader in his field. Randy joined our team in 2015 and has proven himself to be an incredibly talented technician with a quality level that cannot be beat. Randy has been servicing cars and trucks of all sizes, makes, and models for almost 30 years. He is very efficient and works hard to be sure he is completing a product he can be proud of. He takes great care ensuring our customers are getting a great report on the condition of their vehicle, and he works hard to save our customers money whenever possible. He is married to his wife, Linda, and lives in Renton. Originally from North Dakota, he has been in the greater Seattle area since the late 1980s. Tara joined the staff of Integrity Automotive in the spring of 2013. She was born in Tacoma and grew up in Maple Valley. She attended Tahoma High School in Covington. Tara has worked in the automotive industry for the past 10 years, serving as a porter and lot attendant at numerous dealerships. Tara enjoys the family atmosphere amongst the staff at Integrity and stays busy with many different tasks and responsibilities. She makes sure that our facility stays clean, maintains our fleet of loaner cars, and takes care of returning parts to our suppliers. Tara’s career pursuit is to stay in the automotive industry and serve in an office role. In her spare time, Tara takes care of 2 dogs, 3 cats, and 2 fish. As you can tell, she loves animals and she also enjoys shopping. Amos started at Integrity in August of 2013. He was born in Seattle and grew up in Shoreline. He graduated from Shorewood High School and then enrolled at North Seattle Community College. After 2 years, he transferred to Central Washington University where he finished his bachelor’s degree in Accounting. Amos enjoys working at Integrity because of the multiplicity of tasks that he accomplishes. He is in charge of our shop’s inventory and helps with the check-in process of customer’s vehicles. When not working, Amos trains in mixed martial arts, cheers for the Seahawks, and is hoping that the Sonics return to Seattle.